This KentuckyRoads.com news topic holds news items that apply to the state as a whole or to the state government as a whole. Kentucky is the 15th to state to join the union. It became a state on July 1, 1792 and was the first state located to the west of Appalachian Mountains. Before statehood, Kentucky was part of Virginia. Kentucky became a separate county of Virginia in 1776. Both Civil War presidents were born in Kentucky. Abraham Lincoln was born near Hodgenville in Larue County, and Confederate President Jefferson Davis was born near Fairview in Todd County. Kentucky was an officially neutral state during the Civil War. It contributed troops to both the Union and Confederate causes; more than twice as many Kentuckians served in the Union armies than in Confederate armies. Kentucky’s state capital is Frankfort in Franklin County. 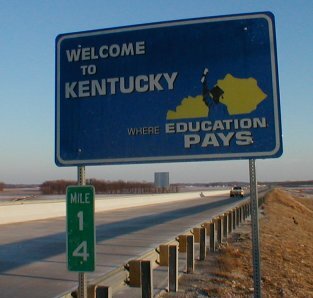 50states.com: Kentucky - Facts and trivia about the state including facts, figures, and state symbols. Kentucky State Data Center - Part of the Urban Studies Institute at the University of Louisville. Includes a rich collection of census information about Kentucky. Kentucky Transportation Cabinet - The official website of the government agency charges with overseeing the states roads, highways, airports, and trains. Kentucky Transportation Cabinet: Current Road Projects - Information about active construction and planning projects. Kentucky Transportation Cabinet: Official Highway Map - Downloadable versions of the official state highway map. Kentucky Transportation Cabinet: Pre-Construction Project Location Maps and Information - Information from the Division of Program Management showing project locations and other information. Kentucky.gov: Facts and History - Links to facts and historical information about the state. Kentucky.gov: My New Kentucky Home - The official web site of state government. Open Directory: Kentucky - A listing of over 6000 Internet sites related to every aspect of Kentucky. MADISONVILLE, Ky.  If youve driven along the Wendell Ford-Western Kentucky Parkway or any number of other highways in Western Kentucky you may have noticed some odd looking purple prisms hanging in trees along the roadside. The strange looking structures have generated several dozen calls to the Kentucky Transportation Cabinet and area police agencies. According to Kentucky State Entomologist Dr. John J. Obrycki, the oddly shaped bright purple structures are taps put out to monitor the spread of the emerald ash borer. A 1980 law ties a portion of Kentucky's gasoline tax to the average wholesale price of gasoline in the state. That price has dropped in recent months, and the gasoline tax is scheduled to drop 4 cents/gallon on April 1st; however, the state legislature is considering amending the law to prevent this drop. It is estimated that tax decrease would result in $120 million decline in gasoline tax revenue. The U.S. Senate recently passed their version of the “Transportation Equity Act.” The senate version of the bill must now be reconciled with the house version of the bill. The president has threatened to veto bill if Congress cannot limit the cost of the bill to $284 billion. I will report on the sections of the bill relating to Kentucky once a conference version is prepared. The Washington-based Council on American-Islamic Relations reports that Kentucky is one of three states that has not addressed religious concerns with driver’s license photographs. Kentucky law states that a person’s facial features are not to be obscured in driver license photographs. Kentucky has a new logo for state marketing campaigns. 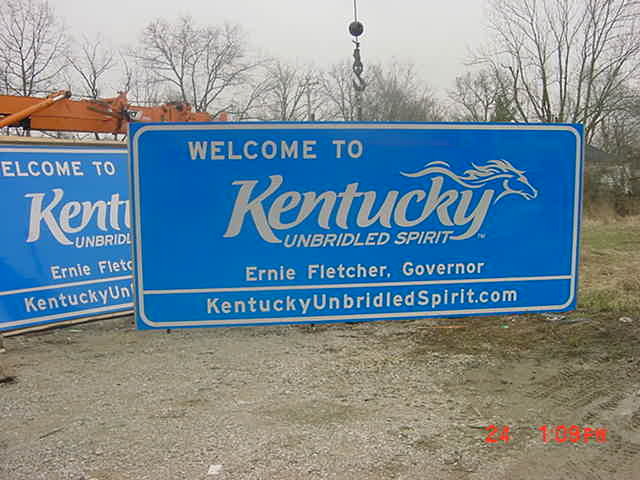 The “unbridled spirit” logo was favored by the vast majority of voters who participated in online polls and submitted paper ballots at state parks and highway rest areas. The new logo is already appearing on signs posted along the state’s highways. Carl Kroboth, an engineer who designed several bridges and highways in Kentucky, died of cancer on Friday at the age of 71. The University of Kentucky graduate founded Kroboth Engineers, which designed the Western Kentucky Parkway bridge over the Green River and the Blue Grass parkway bridge over the Kentucky River. He retired in 1995. "Amish Buggy Riders in Danger as Urban Sprawl Fills Highways"
The past several months has seen a drastic increase in the sale of specialty plates. The unpopularity of the new "Mr. Smiley" plate has been blamed for the increase. 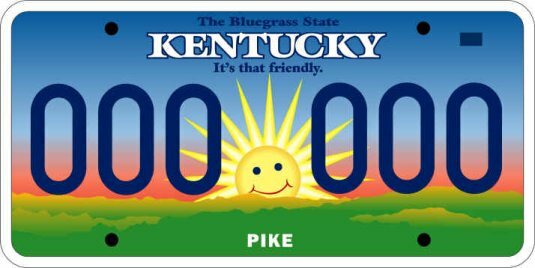 The increased sale of specialty plates means that the charities that sponsor the plates receive more money, about $10 per plate. The Transportation Cabinet receives about the same amount of money from a specialty plate as from a regular plate. In more news of the scandals to rock the Governor's office and the transportation cabinet, word came Monday that hearings on the ethics charges brought against Gov. Patton will not be heard until mid-November. This means that rulings on the charges will not come until after Patton leaves office. "Please Slow Down...My Dad Works Here!" The Kentucky Transportation Cabinet started off the 2002 construction season by promoting their new work zone safety theme: "Please Slow Down...My Daddy Works Here"
The Courier-Journal reports in this Mar. 4, 2002 article that the top donors to Gov. Patton's campaigns have been from the highway industry. The highest single donor has been John Stovall, who heads Road Builders Inc. in Muhlenberg County. Stovall and his wife have contributed $69,200 since the mid-1980s. When interviewed Stoval seemed surprised that he had topped the list. According to this press release , Kentucky's roads have ranked 10th among the 50 states in a review of the cost-effectiveness of highways. and several pavement rehabilitation projects and bridge replacements. U.S. Representative Hal Rogers was the co-chairman of the conference committee that wrote the final transportation spending plan and his guidance helped bring more transportation spending to the Commonwealth. For many years, Kentucky's citizens paid more in federal fuel taxes that in received back from the federal government in the form of transportation spending; however, for Fiscal Year 2002 spending, Kentucky is set to receive more money back than was paid in. The Courier-Journal has this article with more details on transportation spending. This Courier-Journal reports that the number of collisions between vehicles and elks is increasing on Kentucky's highways. Elk were reintroduced into Kentucky in 1997 and in 2000 there were around 30 reported collisions with elk on Kentucky's roadways. The Owensboro Messenger-Inquirer reports in this Oct. 24, 2001 article (no longer online) that a study shows that rural roads in the Green River district of Kentucky are more dangerous than the four lane highways in the region. The Cincinnati Enquirer reports in this Sept. 22, 2001 article that road contractors have been granted immunity from personal prosecution if they testify before a federal grand jury investigating lack of competition in state paving bids. More information can be found in this Courier-Journal article . The Owensboro Messenger-Inquirer reports in this Sept. 5, 2001 article that lawmakers from Eastern from Eastern Kentucky have voiced complaints that Eastern counties are being left out of road plans. The Bowling Green Daily News reports in this Sept. 5, 2001 article that Bowling Green's city council has voted to eliminate its traffic commission. It is believe that this will streamline the traffic complaint process. This Sept. 3, 2001 article from the Glasgow Daily Times reports that the Kentucky State Police is adding new Camaroes to their fleet of vehicles. These vehicles, while still marked, are meant to have a lower profile than the traditional gray Crown-Victorias. The KSP has termed them Special Enforcement Vehicles. The trooper interviewed in the article will be patrolling the Nunn and Blue Grass Parkways and I-65.